The Dragon Quest series' arduous journey to gain a level of Western recognition comparable to Final Fantasy has yielded some of the most robust localization efforts in the JRPG genre. It's up for debate whether "robust" always equals "good;" not everyone appreciates Dragon Quest's cockney accents, puns, and ample alliteration. But long-time Dragon Quest players are generally fine with mixing the Queen's English into their adventure like so much milk into tea. If nothing else, it gives the plucky series a distinct character and sound. It also reminds us of spending time with Yangus in Dragon Quest VIII, and every memory of Yangus is a blessing. In any case, Square Enix is sticking with the unique voice it's given to the modern entries in its decades-old RPG series with Dragon Quest XI: Echoes of an Elusive Age. The hour-long demonstration Square Enix Japan gave me of the game in February offered enough assurance the localization's got everything fans should expect by now: The tinder-dry sense of humor, the groaner puns, and the wordplay that makes you furious for not thinking of the jokes yourself, publishing them on social media, and becoming internet famous. What's more, Dragon Quest XI's localization shadows Dragon Quest VIII's job in subtler ways, like the return of equipment and item menus dressed up with icons and a scroll aesthetic. The cinema scenes are fully voiced, and the English actors are accurately lip-synced with the character models. 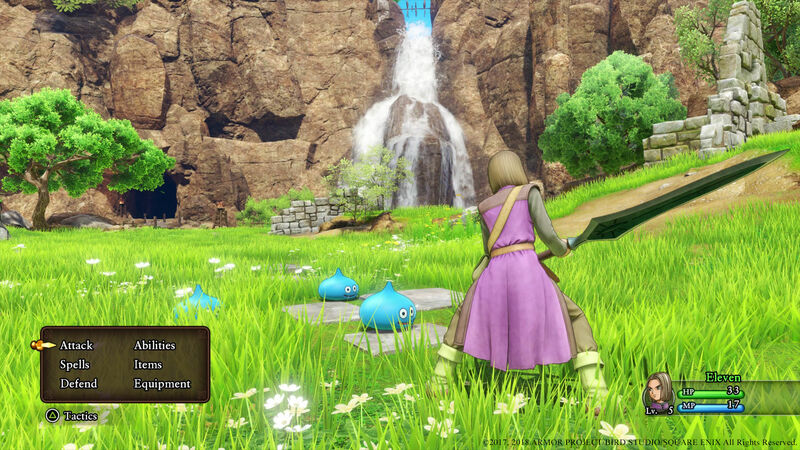 It's clear Square Enix is trying very hard to win over Western players with all of Dragon Quest XI's primp and polish, something it's been attempting with its excellent localization efforts since—well, since 1989's Dragon Warrior for the NES. As established fans know, those efforts have yielded mixed results. The last mainline Dragon Quest game to recieve a localization, Dragon Quest IX for the Nintendo DS, enjoyed some success in North America and Europe. The combined million copies sold was still dwarfed next to Japan's feverish devotion for the series, however. But Square Enix's persistence may finally pay off. It's been a good couple of years for niche Japanese properties seeking a presence in the West. Monster Hunter finally has a sizeable English-speaking audience, and Westerners went mad for Persona 5 and Nier: Automata in 2017. The Dragon Quest series' character designer, manga-ka Akira Toriyama, is as relevant to American children as Walt Disney thanks to the worldwide success of Dragon Ball Z, so Dragon Quest XI's crisp and colorful HD visuals are guaranteed to turn heads by themselves. And when the game comes to North America on September 4, it'll be available on Steam as well as the PlayStation 4. Your adventure begins as all adventures must: With innumerable Slime murders. Finally, though I didn't go hands-on with Dragon Quest XI, the hour I spent watching Assistant Producer Hikari Kubota play through an early story scenario mad me wish I was playing it. Though Dragon Quest XI technically isn't an open world RPG, there's no lack of sprawling green spaces teeming with monster life. What I saw reminds a bit of Monster Hunter: World's ecosystem: The landscape gently corrals you, but also treats you to an environment where monsters truly live in their habitats instead of simply hanging around. You glimpse them in trees, catch sight of them patrolling their territory, and spy them napping at the side of the road. It's hard to resist the call to dive into the game and see what you can see—especially since you're gifted with a horse at the beginning of your adventure for swift travels (and to kick foes out of the way in case you don't feel like letting them get up in your business). You can't solve every problem with a hoof to the face, however, and sooner or later you get pulled into a fight. Traditional turn-based battles are the order of the day in Dragon Quest XI: You and your party members are on one side, and your foes are on the other. You can trade blows, sling magic, and make use of a semi-mysterious system called "Pep Points" that replace Dragon Quest VIII's Tension-building system. The full potential of Pep Points wasn't demonstrated during the session, but a quick description was offered. As you perform action and take damage in battle you and your team build up Pep, which can go back into coordinating massive group attacks. Pep-based techniques can technically turn the tide if a battle is going badly for you—but the flip-side is also true, as enemies can make use of Pep as well. Another way Square Enix hopes to coax more Westerners into giving Dragon Quest XI a try is with its options for self-imposed torture. The "Draconic Quest" feature lets you customize the difficulty of your journey to an almost-hilarious degree. Basic options include making enemies much harder or limiting the armor and weapons your party can buy. A less orthodox means of making yourself suffer involves inflicting your party with "Shypox"—a permanent status ailment that randomly causes members to falter, get embarrassed, and miss their turn when they're supposed to perform in battle or heal an ally. The stage is once again set for Dragon Quest to make a big impression on a fresh Western audience. Will this be the series' breakout moment? Will Square Enix see a massive adoption movement akin to Capcom's recent Western success with Monster Hunter: World? Dragon Quest XI looks great, it sounds good, it's getting a Steam release alongside its console release, and the success of another turn-based RPG—Persona 5—proves North America isn't as allergic to "old fashioned" JRPG systems as some people initially thought. If Dragon Quest is going to shine on these shores, it's now or never. Tagged with Analyses,	Square Enix.